The HARU presents an array of natural oak tones. The knots and grains of the natural oak are expressed and enhanced by brushing the surface in order to accentuate its natural grain structure. The timeless beauty of HARU compliments both contemporary and traditional spaces, giving a feeling of warmth and comfort to your home. Engineered Oak hardwood floorboards are the most sought-after timber flooring by architects and discerning home-owners as they are stronger and wider than standard floorboards, are pre-finished for easy installation, and still boast the beauty of real European Oak. Moku European Oak floorboards are 2200mm long and 220mm wide with a UV protected satin finish. These extra-wide floorboards are 20mm thick, super long and super wide giving them superior strength, density, and rigidity which enables a quick installation over any flat, sound subfloor. The 20mm engineered oak floorboard range is supplied by GrandOak, a leading Australian floorboard manufacturer, who offers the same range under their "GrandOak Monarch" series. That means you get the benefit of local supply, support and a lifetime Australian warranty, at a highly competitive price by avoiding showroom prices. HARU is graded as an ABC grade of timber, meaning the floorboards have fewer knots, more variations in colour and texture giving it a beautiful natural look. HARU may feature knots of no more than 20mm in diameter with flashes of colour, burrs, some mineral streaking and grain pattern giving it great natural character. NATURAL PRODUCT: Timber floorboards are a natural product and can present a variety of colours and natural grain and knot variations. These are not manufacturing faults. Do you want underlay? Laying premium underlay can provide important benefits such as: subfloor protection, moisture protection, and sound reduction. Need stair edging? Architecturally designed solid oak stair nosing is your best choice - available in all the Moku finishes. See more details here. Need edging (scotia)? Edging covers perimeter expansion gaps along skirting boards, walls, kitchen kickboards. Available in all the Moku finishes. See more details here. SHIPPING A special freight charge is applicable to floorboard orders (get a live quote on floorboard pages). It includes convenient delivery to your door! See important shipping information. 220mm wide x 2200mm long x 20mm thick. Base layers are cross layered and glued plywood plantation timbers. 1 in 4 planks are precut to two shorter random lengths to assist installers with staggering boards. Natural Oak tones giving a sandy, blonde and desert colour. ABC grade of timber, with occasional knots <20mm in diameter. Click here for grading definitions. Luxury smooth satin finish including full UV protection. Ready to walk on after installation. 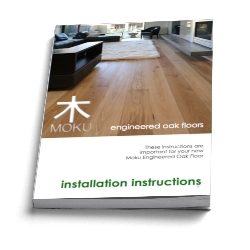 Download the Moku Floorboard Installation Instructions - it is important to follow these instructions to ensure your flooring is correctly installed and fully covered by the warranty. European Oak is very resilient, though it is important to care for and maintain your floorboards to ensure they stay looking beautiful. 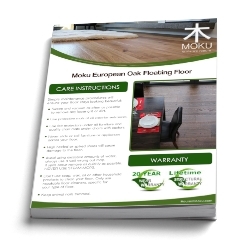 Download the Moku Oak Floorboard Care Brochure to understand how to keep your floorboards in pristine condition for years to come. Moku floorboards are protected by GrandOak's comprehensive warranty that provides 20 years protection on surface wear under normal use and a lifetime structural protection for structural defects such as delamination, cracking, warping or twisting including any structural deformations at the time of supply. Installation instructions must be adhered to and terms, conditions, and exclusions apply. See the full floorboard warranty here.